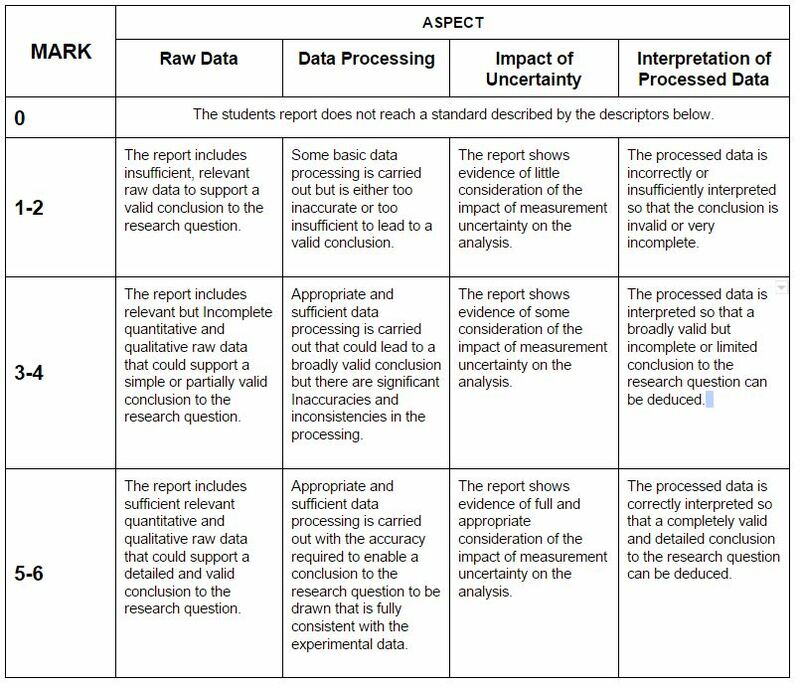 This criterion assesses the extent to which the student’s report provides evidence that the student has selected, recorded, processed and interpreted the data in ways that are relevant to the research question and can support a conclusion. Data is collected for a minimum of 5 levels over a suitable range of the MV. Data is collected for a minimum of 5 repeats (for SD, more for correlations). Data is collected to show consistency of CV. Insightful and thorough qualitative data (observations and/or photos). All data are recorded correctly and honestly. ​Raw data is the data you collect during the investigation to help answer the research question. Raw data can be quantitative (numbers) and/or qualitative (descriptions). The best way to record data is by using data tables (click here to see an example). Give an identifying, specific title to each data table. Number tables consecutively through the report. Calculations to determine RV, if necessary (i.e. rate). Calculations and/or significance tests appropriate to investigation. Justification of the data processing methods. Statistical tests include full details including null and alternative hypothesis, DF, critical values and probability levels. Formula, Excel formula, worked example or screen shot of calculations given. Appropriate choice of graph with variables on the appropriate axis. ​This is the part of the report in which students take raw data and transform it into results that answer (hopefully!) the research question. Click here to see an example. Here students show the calculations that give a numerical result. Statistics are useful mathematical tools which are used to analyze data. Click for more information about statistics. Data processing involves, for example, combining and manipulating raw data to determine the value of a physical quantity (such as adding, subtracting, squaring, dividing), and taking the average of several measurements and transforming data into a form suitable for graphical representation. It might be that the data is already in a form suitable for graphical presentation, for example, distance traveled by woodlice against temperature. If the raw data is represented in this way and a best-fit line graph is drawn, the raw data has been processed. Plotting raw data (without a graph line) does not constitute processing data. The recording and processing of data may be shown in one table provided they are clearly distinguishable. Students should present the working for processed data so that all the stages to the final result can be followed. Show at least one example of the working required for each data processing calculation. Use plenty of room; make sure working is clear and legible. Inclusion of metric/SI units is expected for final derived quantities, which should be expressed to the correct number of significant figures. Show the units of measurements in all calculations and pay attention to significant digits! Don’t lose accuracy by carelessly rounding off. Round only at the end of a calculation. Do not truncate. Correct uncertainty reported for raw measurements. Correct and consistent number of digits throughout. Discussion of the size of uncertainties compared to the data collected. SD error bars included and labeled on graphs. In addition to reporting the correct measurement uncertainty, students must explain the impact (or not) of the measurement uncertainty on the results and/or conclusion. Data pointed joined to illustrate the trend (unless comparing qualitative IV). Patterns and trends in data described with reference to graphs. Variation (i.e. SD) within the data discussed. Correct conclusion of significance is drawn.